Norwegian infantry officers were issued Browning designed pistols built under licence by the local firm Kongsberg. Infantry companies were equipped with the Krag rifle or carbine. 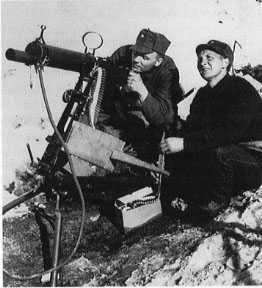 The standard light machine gun was the Madsen m/22 and was issued to infantry platoons. Heavy machine gun sections were armed with the m/29 machine gun and this was another Browning designed weapon built under licence by Kongsberg. Mortars were only issued in small numbers and these were built by Kongsberg. These weapons were the standard Stokes/Brandt design built under licence.